"The Department Store Mystery" is the 46th Mandrake Sunday story. The story was written by Lee Falk and drawn by Phil Davis. Every night the department store are robbed, but by whom ? 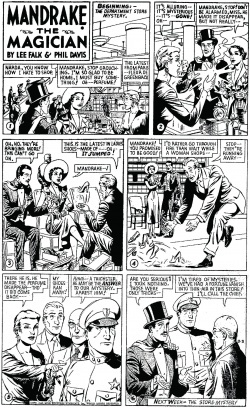 The title for this story is taken from the strip of September 3, 1950 (Beginning: The Department Store Mystery.). This page was last edited on 25 June 2017, at 16:30.